So how can motion sickness in engineering class driving simulators be eliminated? Working backwards, we can assert that a driver who is successfully immersed in a high quality, convincing virtual driving experience is not, by default, being subjected to the triggers that cause motion sickness in the first place. But getting to this level of simulator performance and refinement involves some technical challenges. For example, it is certainly important to be able to efficiently execute all the required physics models and be able to communicate synchronously - and with extremely low latency - amongst all the real-time hardware and software systems in play. This is an all-encompassing statement, so it may be useful to drill down and discuss some specific guidelines that are vital for meeting all the cause-and-effect expectations for DIL simulator drivers. 1. Start with first principles. A DIL simulator should be a pleasing symphony of various elements with a solid engineering foundation. For example, if other things are held constant, the dynamic performance of any DIL simulator will decrease as the size and mass of the motion machinery and payloads increase. If the fundamental DIL simulator design itself restricts its dynamic performance, there will be no way to avoid mis-cues and prevent driver discomfort. Luckily, there are next-generation DIL simulator solutions that can be adopted to avoid this. Complex software strategies can be applied to ease simulator motion sickness triggers. Common examples are predictive and/or adaptive control strategies that might be used for simulator motion systems. However, when such strategies are required rather than optional, it is usually an indicator that the underlying motion systems are not capable of repeatably, confidently delivering correct driver cues. 3. Abandon flight simulator strategies. Aircraft flight is not restricted to planar motion, so a pilot can experience a large visual tilt in the horizon line without sensing lateral acceleration. In a ground vehicle, this is not the case, and a driver expects to feel accelerations in a reference frame that is aligned with the earth. If this expectation is violated, a driver’s sense of postural stability can be disturbed, causing disorientation and nausea. This is why it is advisable to avoid simulator “tilt compensation” and similar schemes. As mentioned above, this is crucial for accurately replicating real vehicle control and response sensations. For example, motion and vision systems must certainly be fast, with robust, low latency pipelines. But perhaps even more important to DIL simulator drivers is having the visual and inertial worlds well-aligned in time. This requires a simulator computation architecture that can smoothly manage multiple applications. A DIL simulator driver is receiving a continuous mix of information, and is therefore unable to discern between sensations that are created by a vehicle model, or sensations created by motion and/or vision cueing. Therefore, a flexible simulator tuning tool set needs to be in place on the operator/engineer side in order to objectively identify and address issues that might be disturbing for the driver. In addition, having an open, modular simulator architecture will facilitate explorations of other cueing systems (audio, tactile, etc.) that may improve overall driver immersion. 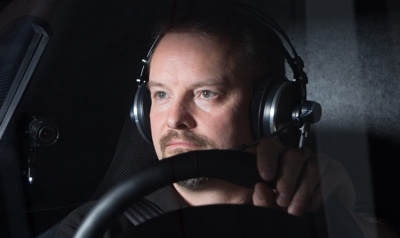 To learn more about eliminating motion sickness in driving simulators and the advantages of next-generation, low-latency driving simulation, download our FREE white paper, “Look Down the Road: Driving Simulator Technology and How Automotive Manufacturers will Benefit”.